i.v. solubilized CoQ10 (30 mg/kg) or saline (1 ml/kg). 0.01), limitation of infarct zone by 35% (p < 0.01). farct size (r = −0.77, p < 0.001). Conclusion: Single i.v. quantity of CoQ10 in LV. dicals, intracellular Ca2+-overload, fast pH changes . Excessive formation of free radicals results in cell death. (Russian Foundation of Basic Research). cardial level and IR injury. cycle at 22˚C with free access to tap water and food. trochemical detection as described previously . same study procedures except coronary artery occlusion. sodes per one rat; 5) number of rats with lethal VTA. again and Evans-Blue stain (5%, 0.5 ml) was infused i.v. after assessment of myocardial damage. “CoQ10 + IR” group during ischemia. 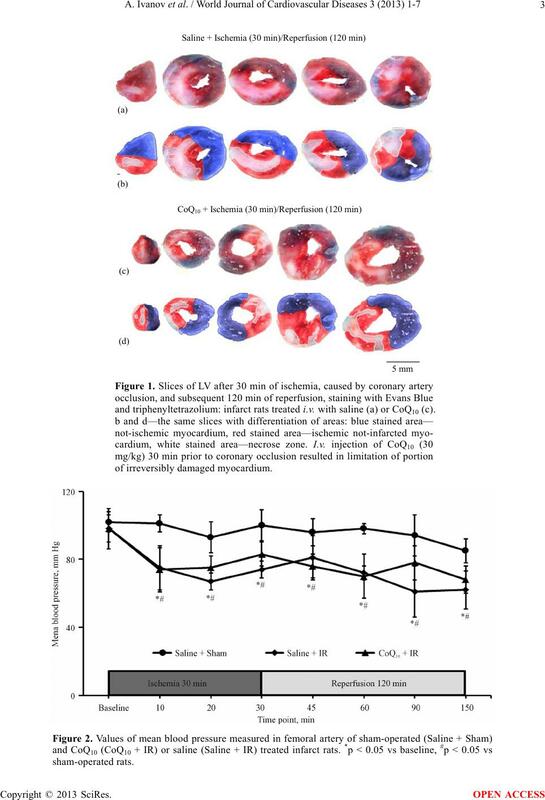 and triphenyltetrazolium: infarct rats treated i.v. with saline (a) or CoQ10 (c). equal baseline ischemia conditions (Figures 1 and 3). with saline-treated rats (p < 0.01). dium (r = −0,77, p < 0.001; Figure 5). calculated relatively to sham-operated animals. Table 1. 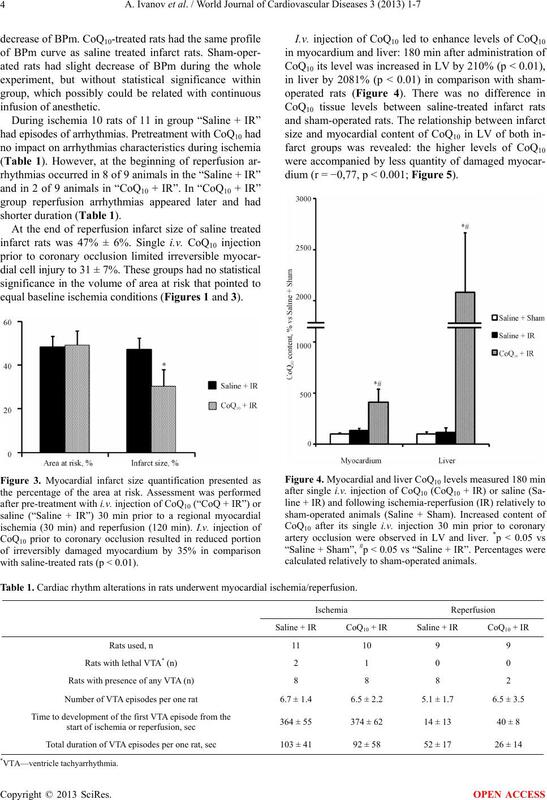 Cardiac rhythm alterations in rats underwent myocardial ischemia/reperfusion. rats and LV infarct size (r = −0.77, p < 0.0001) was calculated. was accompanied by limitation of IR injury. of its levels in myocardium 30 min after administration. the model of myocardial IR. ; limited infarct size . against subsequent IR as effective as liposome forms. I.v. also reported in previous studies [21,28]. tochondrial permeability transition pore in heart disease. Biochimica et Biophysica Acta, 1787, 1402-1415. 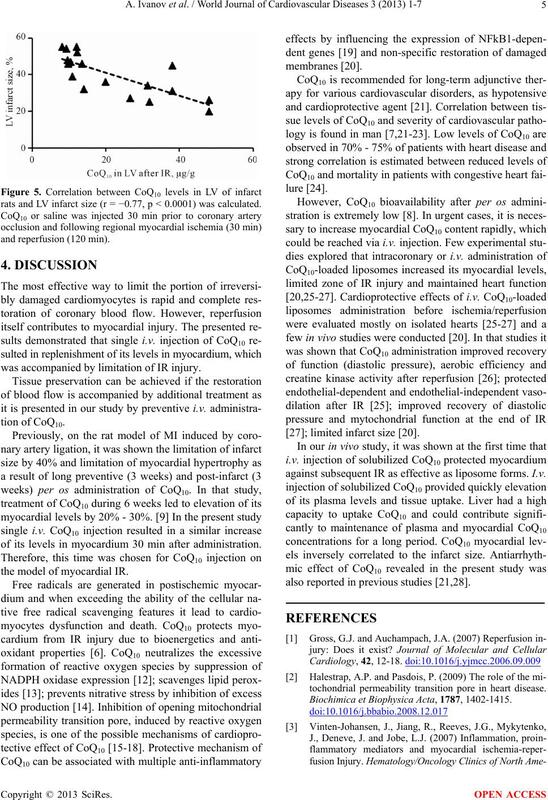 College of Cardiology, 58, 2357-2362.
dial ischemia-reperfusion injury and rationale for therapy. 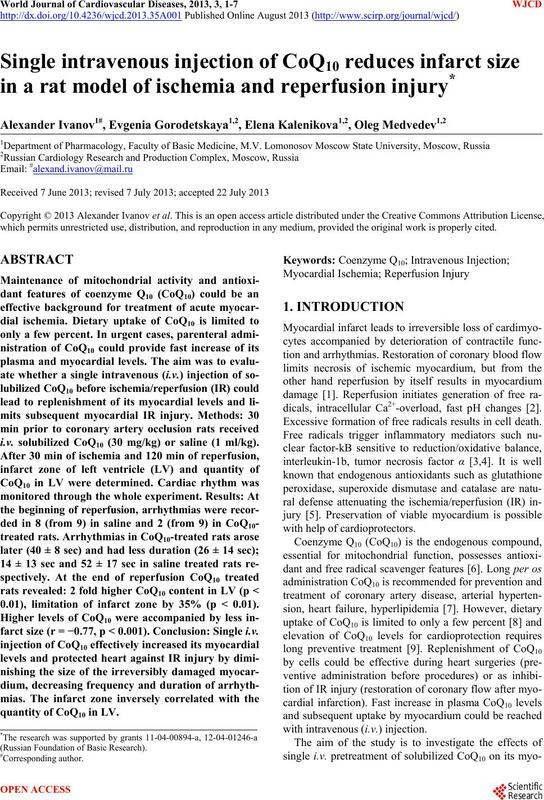 American Journal of Cardiology, 106, 360-368.
physical Research Communications, 396, 74-79.
coenzyme Q10: An update. Nutrition, 26, 250-254. F.C., Bindels, L.B., Niklowitz, P., Menke, T., Cani, P.D. 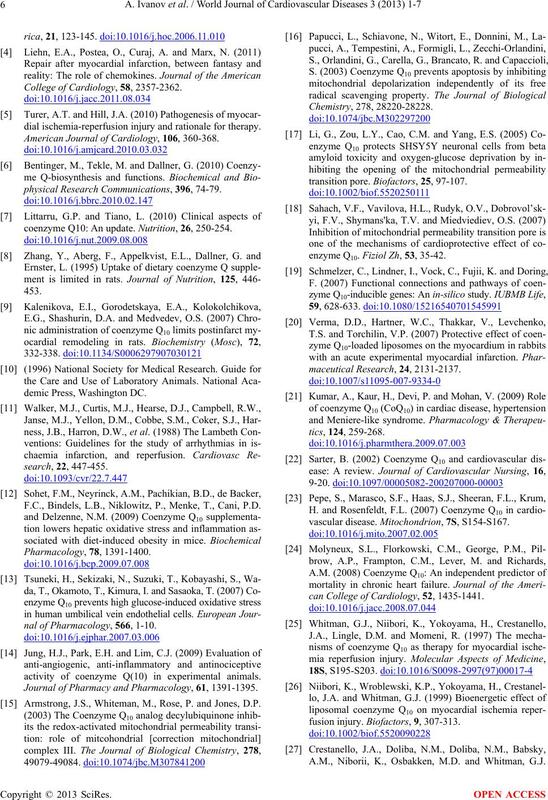 nal of Pharmacology, 566, 1-10.
activity of coenzyme Q(10) in experimental animals. 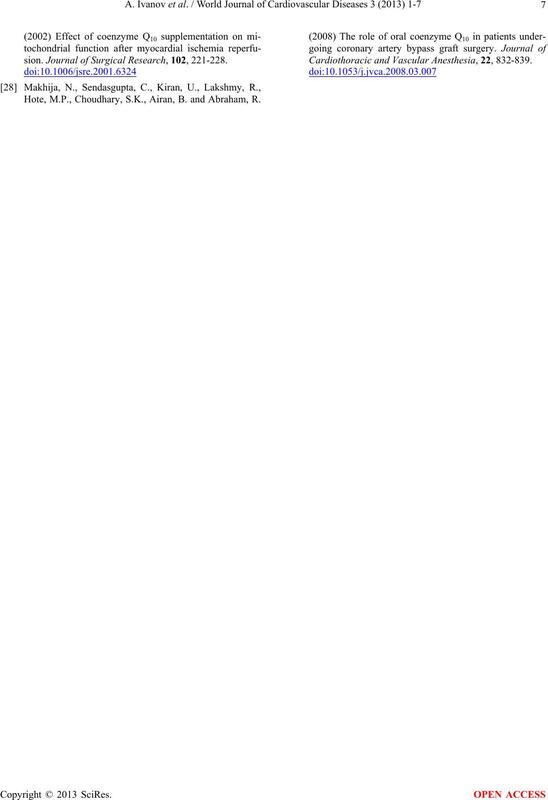 Journal of Pharmacy and Pharmacology, 61, 1391-1395. Armstrong, J.S., Whiteman, M., Rose, P. and Jones, D.P. transition pore. Biofactors, 25, 97-107.
enzyme Q10. Fiziol Zh, 53, 35-42.
vascular disease. Mitochondrion, 7S, S154-S167. can College of Cardiology, 52, 1435-1441.
fusion injury. Biofactors, 9, 307-313. A.M., Niborii, K., Osbakken, M.D. and Whitman, G.J. sion. 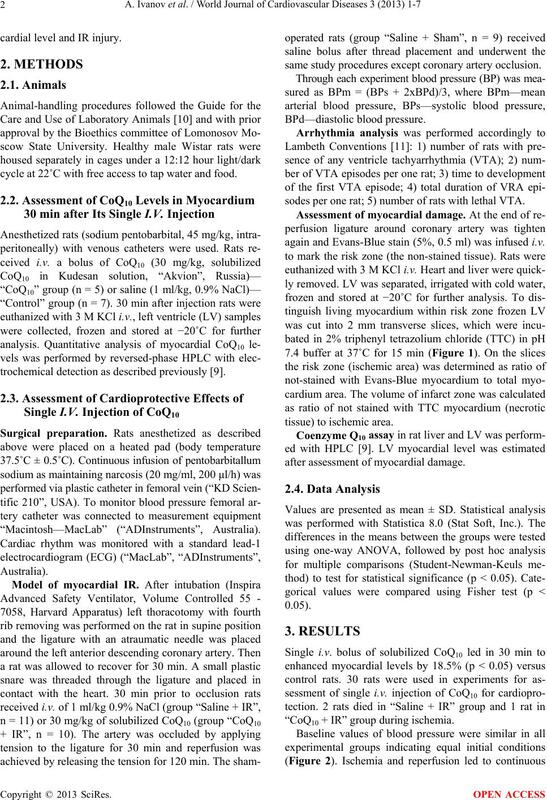 Journal of Surgical Research, 102, 221-228. Hote, M.P., Choudhary, S.K., Airan, B. and Abraham, R.
Cardiothoracic and Vascular Anesthesia, 22, 832-839.